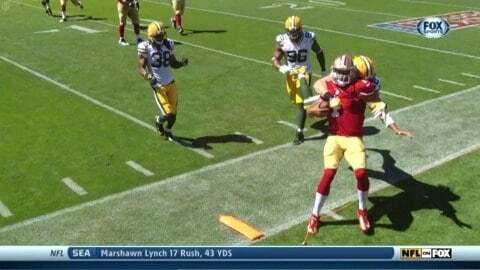 Many of you are already talking about this play that occurred in the Packers-Niners game a little while ago. Packers linebacker Clay Matthews was flagged for a late hit on Kaepernick well after Kaepernick had stepped out of bounds. The two teams engaged in a small scuffle afterward, when the 49ers were hit with unnecessary roughness foul. Because the Matthews foul was two steps after the ball was dead, the fouls were on the dead-ball side of the ledger, and the proper call is to offset the two fouls and the down counts. That would have given the 49ers a fourth down and a likely field goal situation. Instead, Bill Leavy and the crew offset and replayed the down. The 49ers took another shot for the end zone, and they scored. While I don’t agree that it necessarily “cost Green Bay the game”, as some are saying, it certainly didn’t help. The Niners still might have gone on to win, but you never know. Clay Matthews also had that soccer-esque fake dive to try and draw a penalty late the game, which fortunately the refs didn’t believe. My opinion of him certainly dropped today. Check out the FootballZebras post for a bit more info about it. Who is fired up for some Lions-Niners? Who would have thought that a week 6 match-up between the Lions and 49ers would be such a big deal. As a life-long suffering Lions fan, I love it! Mike Carey will be there in Detroit, so hopefully it’ll be a great game. We’re still trying to dig up a few assignments, but most of the week 6 referee assignment list is ready to go. If you can help with either of the missing games (Carolina/Atlanta, New Orleans/Tampa Bay), post a comment in there (with your source) and let us know. Thanks! St. Louis Rams interim coach Jim Haslett has been fined $20,000 by the NFL for “going onto the field and directing profanities at a game official” during a game a few weeks ago against the San Francisco 49ers. It’s not clear what he was upset about, and the Rams had just completed a 29-year pass. It’s also not clear who the official was that he was yelling at, though we know that Alberto Riveron was the referee for that game. Is it just me, or is the number of fines for things related to the officials (complaining, mostly) much higher this year than in years past?